Georgia Farmers Market Association is thrilled to announce our first annual Local Low Country Boil dinner, hosted by B’s Cracklin BBQ on Sunday, March 24th at 7 p.m. The Local Low Country Boil dinner will benefit our Just Food Farmers Markets launching this June, 2019. Just Food Farmers Markets will create equitable access to fresh, local food for Georgia families through sliding scale pricing. Purchase your dinner tickets and help others afford to eat well. 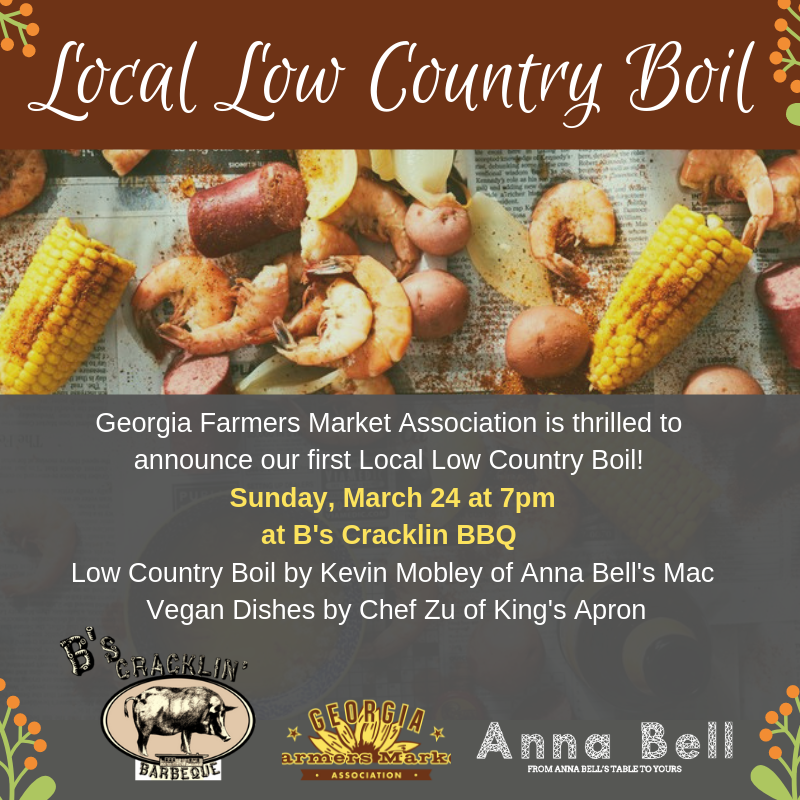 Come out and enjoy some delicious, locally made Low Country Boil prepared by Kevin Mobley of Anna Bell’s Mac, with vegan dishes prepared by Chef Zu. Learn more about the power of Just Food Markets, and engage with food justice advocates. Let’s Reimagine How Our City Grows! In a time of rapid redevelopment in metro Atlanta, the pressure on urban farms and community gardens has increased dramatically. In partnership with Atlanta Regional Commission, Food Well Alliance will embark on a pilot project that brings together local governments and communities across the five-county metro Atlanta region to create a city-wide plan that incorporates agriculture into the next phase of their development. Come share your ideas and hear from metro Atlanta farmers and local food experts about the value that community gardens and farms can bring to your city as it develops. From roadways to rest, anger to athleticism and identity to ethics, 17 TEDxAtlanta 2019 speakers will present ideas that challenge us to reconsider what we think we already know and to inspire us to look at the world through their eyes and what they’ve created. Between speakers blocks, attendees will have the opportunity to experience some of these ideas in the X Zone as well as those of Atlanta’s most promising makers and innovators.